Air quality can become a serious issue for many people in Nashville, TN who suffer from symptoms of seasonal allergies and asthma. If the air quality in your home is less than acceptable for you or a family member, now is the time to call Mid–State Air Conditioning, Heating & Plumbing and ask to talk with one of our air quality specialists. We will work with you to come up with a lasting solution. There are many potential pollutants that can build up in your indoor air supply. Common indoor air problems include high–levels of dust, pet dander, pollen from ragweed or other plants and flowers, mold spores, dust mites, and germs such as bacteria and viruses. If anyone in your family suffers from more frequent symptoms of allergies or asthma it is usually a sign of an air quality issue. If you notice their symptoms worsening, it is important that you call an expert to visit your home and perform a thorough inspection and recommend the right combination of air quality systems to alleviate the symptoms. We offer a number of services designed to resolve symptoms of different forms of air–quality pollution. 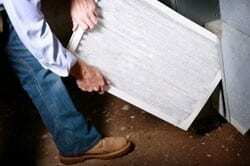 The most common form of air quality system is a filtration system. Filtration is accomplished by installing a media filter in your air handler to capture and remove smaller particles such as dust and pollen. Standard filters are 1 inch in diameter, pleated, and are effective at removing a significant percentage of the pollutants in the air. However, stock filters installed with air handlers tend not to remove nearly as much as higher MERV rated filters. We can recommend an upgrade that will provide better protection and effectively remove unwanted pollutants from your air supply. Other air quality system upgrades you can make in your home include installation of a new humidifier, dehumidifier, or UV germicidal light. We also offer comprehensive duct sealing services. Our indoor air quality services are designed to improve the air quality in your home and reduce the number of pollutants and contaminants your family members must breathe on a daily basis. We also offer comprehensive maintenance and repair services for existing air quality systems. If you have an existing filter or humidity control system that is not working properly, give us a call to thoroughly inspect that system and perform any necessary repairs. Whether you need a new filtration system or a comprehensive humidity control system for your Nashville, TN home, contact the indoor air quality experts at Mid–State Air Conditioning, Heating & Plumbing today. We can help you choose the right system for your home and ensure it is properly installed and well maintained for years to come.